Have you ever wondered where your personal identity and sense of style came from? 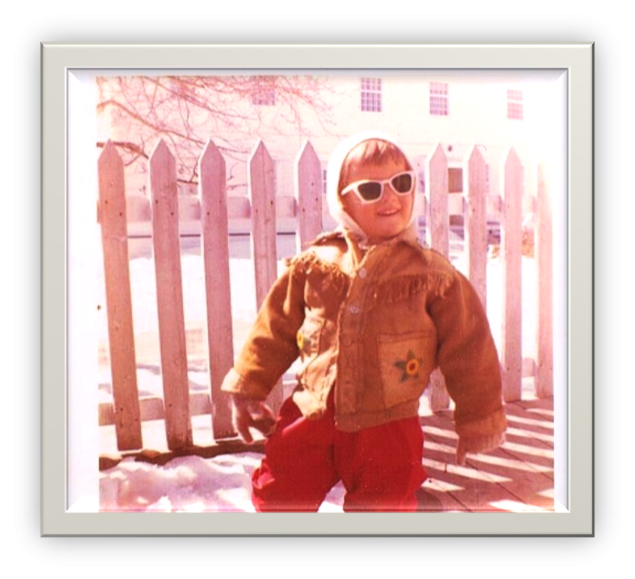 I am sure I was destined to be an Image Consultant when I was just 2 years old! I remember that I liked to dress in bright colours and in latest styles — whatever those might have been in 1957! My mother, Rachel, told me that I would always say, ‘Mommy I need my sun gwasses” before we could leave the house. And so my image journey began. As a very young child, I saw my mother as a beautiful princess. For all the years that followed, she continued to have a great influence on how I would evolve as a young woman and eventually define myself through my own style. Looking back, I see how my mother’s love and devotion had made the greatest impact on my body image, although I wouldn’t have known to put a label on it at the time. I have very vivid memories of sitting at the end of my mother’s bed, watching her get ready for work. My mother was a bank teller at a small local bank and took great pride in her daily appearance. She would wear the most fabulous outfits that highlighted her frame and figure, and kept her rich chestnut brown hair in an upsweep chignon. Her jewellery, shoes and handbags were always chosen with care. Each morning she would go out the door looking like she was on her way to an MGM studio. When my mother returned home later in the day, the first thing that she would do after giving me a big hug was to change into another stylish but more casual outfit. She would refresh her make-up and always look beautiful for the remainder of the evening. I cannot remember a day when she didn’t do this. Her transition from one stunning look to the next was seamless. At 86 years old, my mother still follows the same personal grooming and beauty regime that she did for all the years that I was growing up. She still puts on her make up first thing in the morning, finds a nice outfit to wear, and leaves her senior’s suite looking like a million dollars. She does not look or act her age, and she still turns heads wherever she goes. People are drawn to my mother’s magnetic personality and always leave her presence with a smile. She has been a wonderful role model and inspiration for me to this very day. In contrast to my mother’s petite figure, I was a butterball as a child and a bigger girl in my teens. Even so, I was blessed with great self-esteem, instilled in me by her. Whether I was size 16 or size 2, I enjoyed expressing myself through trendy clothes and exploring different styles. From my Janice Joplin phase with long, crazy hair and wire-rimmed glasses to my hot pants Twiggy-look, one thing that never changed was that I was always conscious of the image I wanted to portray. Just as I consciously expressed myself in different ways over the years, I was also keenly aware of other people’s images and what it expressed about them. I often found myself studying others’ looks, body language and conduct. A few gentle adjustments can have a lasting impact on how you feel and how others perceive you. My positive body image came from a mother whom I admired and who believed in me. Through her love and example, I have developed an inherent understanding of how to help others enhance their own self-image. Who in your life influenced your image? Discover how to start bring your best self forward with a FREE 15 minute call.